In my final year of university I started clipping maps from the San Francisco Chronicle. I was fascinated with how these mostly black-and-white graphics used effective figure-ground contrast “against the rules” to focus reader attention on the most important content. The darkest element on the map was often not the most important. 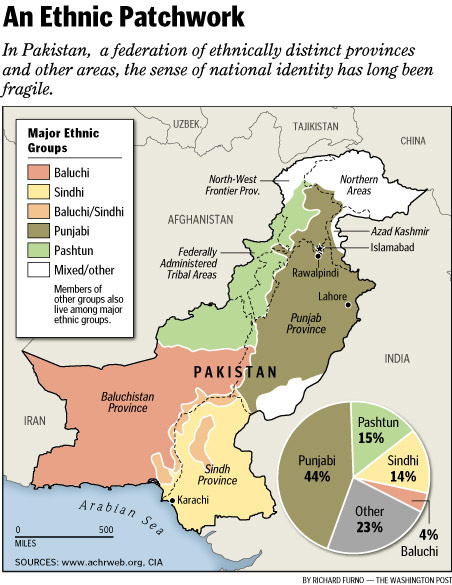 Instead, these maps “highlight” important content by “shading” the focus country white. Surrounding countries were light gray and water a darker gray. The only pure “black” elements in these graphics were nouns: the text labeling feature names. By virtue of being white, the focus country allowed for black labels placed within to “pop”. Most of the newspaper page surrounding map graphics is “white.” By making the map’s edges darker (the non-focus countries and water gray) the map is “framed” and established as a distinct visual element requesting attention. Using a black pointer box with reversed text to indicate the map’s starting point further strengthens the graphic’s figure-to-ground contrast. Color graphics can fall into the trap of treating every category as equal. Doing so can create graphics without any focus or visual contrast. Often one category is more important than the other. Or colors used to symbolize nominal or ratio choropleth categories are so close together they are indistinguishable and create little or no visual appeal. There are also legibility problems associated with impaired color vision. Today, I now work for a newspaper that’s bravely entering the digital age. Often there are two versions of a graphic starting with the print’s black-and-white “constraints” and then satisfying the web’s “need” for color. I often notice that the black-and-white version has a stronger visual impact than the color version. Anytime I see a color graphic I now wonder if it might have been better presented in black & white. Color might be a luxury afforded to us on the web, but contrast should still provide the visual skeleton that color accentuates. Color (hue) should act as the 2ndary visual variable to contrast (tonal value). I’ll even make the heretical leap that some black-and-white graphics should stay black-and-white. If something isn’t broken, why fix it? If only we all had Ansel Adam’s eye. 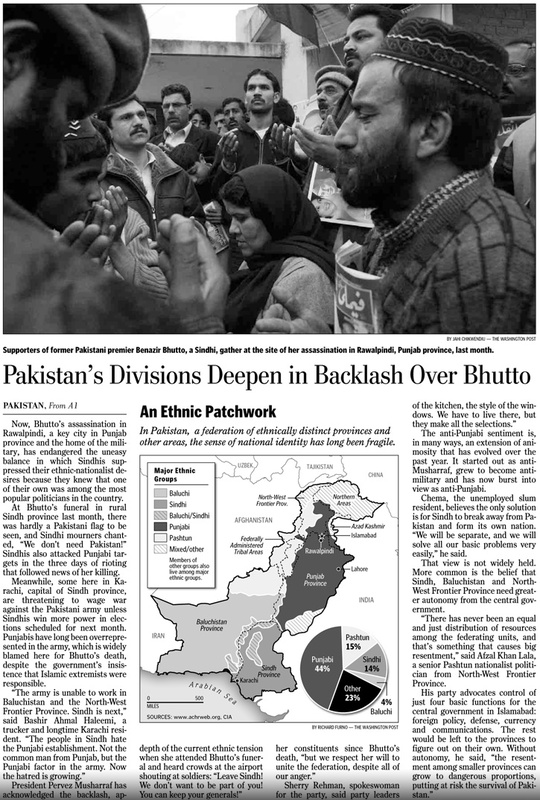 Here are two versions of the same graphic (above and below) that published in Monday’s Washington Post with a story on Pakistan’s “Ethnic Patchwork“. Which do you prefer? Thanks to Isabel and Laris for talking thru ideas in this blog post. This entry was posted on Monday, January 7th, 2008 at 8:32 pm	and is filed under Best practices, Design, Mapping, Print. You can follow any responses to this entry through the RSS 2.0 feed. Both comments and pings are currently closed.